The product attributes feature enables your customers to rate various details of all your products. You can also showcase product attribute ratings on your product page to improve the user experience and potentially increase your conversion rate. Product attributes are the various aspects of your product that can be rated individually. E.g. for clothing products the attributes would be fit, quality and value for money. What are product attribute ratings? Just like your product's overall star rating, your customers can rate your product’s individual attributes on a scale of 1 to 5 stars. These do not affect the overall rating of the product, but it allows people to see how individual product attributes measure up. Your customers can rate predefined attributes and they can suggest their own, making it easy for them to rate what matters most to them while giving you valuable feedback at the same time. Why are product attribute ratings valuable? Showcasing product attribute ratings directly on your product page can help your customers make more confident buying decisions. Our Product Reviews and Product Reviews SEO TrustBoxes already support the display of product attributes and their ratings. All you need to do is enable product attribute ratings in the configuration page of your chosen Product Reviews TrustBox. Your existing TrustBoxes will automatically start showing product attribute ratings once enabled, so you don't have to get and implement the code again. Either Product Reviews TrustBox widget provides a full overview of attribute ratings for each product, giving your customers the product knowledge they need to buy from your site. In a nutshell, these widgets can improve the user experience and increase your conversion rate. Product attribute ratings give you powerful product knowledge that can help guide your product decisions in the best direction — find out why certain products really shine, what works well and what needs attention. Please note that if you’re using the Product Reviews MultiSource TrustBox it's currently not possible to display product attributes, but we’re working on it. What products are eligible for attribute ratings? We currently support Apparel, Accessories, and Electronics product categories. More product categories and product-specific attributes will be added shortly. If your products belong to other categories, consumers will be asked to rate the general attributes “Quality” and “Value for money” instead of product-specific ones. Will product attribute ratings affect my product reviews’ response rate? Our data shows that users asked to rate attributes are more likely to complete their review than those who only rate the overall product. We also see a slight increase in the length of reviews for products that include attribute ratings. Why? We think that asking customers about specific attributes helps them think about the product in more detail which makes it easier for them to write their review. How do I enable product attributes? Product attributes are an integrated part of product reviews. That means they’re available and automatically enabled for all your products. Please note that this feature is currently only available for companies in English-speaking markets. The rest of the world will follow shortly! 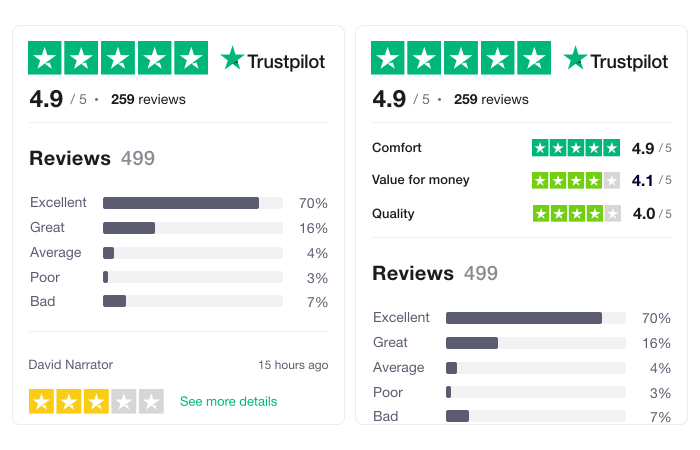 If you want to disable product attributes, go to Trustpilot Business > Product Reviews > Product Attributes and toggle the slider to NO. Remember to set up your product catalog. If your product isn't covered by the categories with product-specific attributes, customers will be asked to provide feedback using the general attributes like “Quality” and “Value for money”. Not all my products are eligible for product attributes. Do I need one widget to display product reviews and one for product attributes? No, you only need to implement either the Product Reviews TrustBox or the Product Reviews SEO TrustBox. If the product has attribute ratings, the widget will automatically toggle the ratings on. If not, the widget will automatically toggle the attribute ratings off, and only show the overall star rating and reviews for the product. 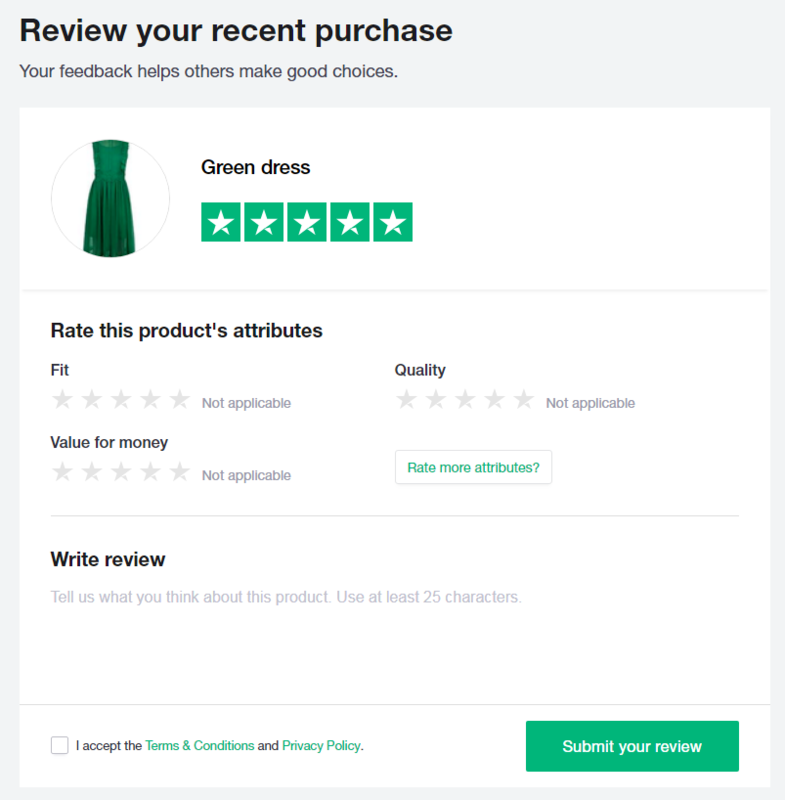 What do my customers see when asked to rate product attributes? Can I add my own attributes? Not at the moment, but in the future you'll be able to add more attributes from a selection we provide. We currently support the attributes listed earlier, but we’ll continue to develop this feature and add more attributes for specific product categories. Do you support custom attributes? We don't support custom attributes at the moment (i.e. attributes you can entirely make up yourself), but please reach out to Martin Mouritzen or your Customer Success Manager if you have feedback about this feature. Is there a product attributes widget? Yes, if you use the Product Reviews TrustBox you simply need to press “Show attribute ratings in all my Product Reviews TrustBoxes” in your Business Account. As with our regular SEO TrustBoxes for Product Reviews, the Product Reviews TrustBox has the same powerful Schema-markup created to improve your SEO. If I disable product attributes in the Business Account, will my product attribute ratings be removed forever? No, you will simply stop collecting them. All old reviews will keep their attributes, and no data is lost if you decide to enable them again at a later point. Will the export of product reviews include product attributes? Yes, the export file will contain all attributes reviewed for each review.